Adding any of these decorative washes is a great way to change the look of your home or property. In our guide, we breakdown the 3 main types of decorative wash. We'll discuss the differences of each type and how to decide on the best look for your property. These types of washes are often regarded as "shabby chic", "antique", or "french country". As you may have noticed, it's a look that has become popular with higher-end new constructions homes. As a result, the popularity of decorative washes has increased over the last 5 years as people look to modernize their existing homes and businesses. This unique change looks great on exterior brick and stone or on the interior in places like the kitchen, fireplace, or accent wall. Another reason property owners opt for a decorative wash is because it's a cost effective way to change the look of your property without having to alter the structural integrity. When it comes to decorative wash styles there are differences on how each term is defined, what material are used for each method, and the final look that each achieves. However, when researching online, you'll find inconsistent information. This makes it difficult for you to choose the look you desire and clearly communicate that to your contractor. Therefore, let's go over the three most popular options you'll want to know about. 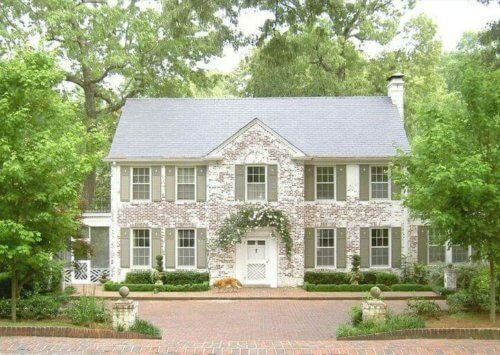 White wash is a mixture of water and paint, the thinner the paint, the more the brick color will show through. Furthermore, you can get a variety of different looks just by testing different thicknesses of paints. Whitewashing is generally the lightest coating of the three brick wash methods and is typically done two ways. An overall coat of thinned paint covering all of the brick and mortar. Tactfully coating areas with thin and thick paint, and then scrubbing or washing away the wet paint in some areas. As a result giving the brick a worn look. A type of mortar wash, German smear is achieved by tactfully smearing a mixture of mortar and portland cement onto the brick, leaving some of it exposed. Typically this process is done with white mortar. You can also achieve a variety of looks with the German Smear depending on how it's applied and the thickness of the coats. With this decorative wash you can expect a more "textured" look with some thinner and thicker spots. Most noteworthy, you'll usually only see German Smear on high-end construction and historic properties. Slurry is another type of mortar wash that is done by completely coating the area with a thick layer. Slurry uses the same materials as a German Smear but differs in the application. With a slurry there is full coverage of the masonry producing a stucco-type look but still allows the brick texture to show through. Typically, slurries are done with slightly tanner mortar colors. 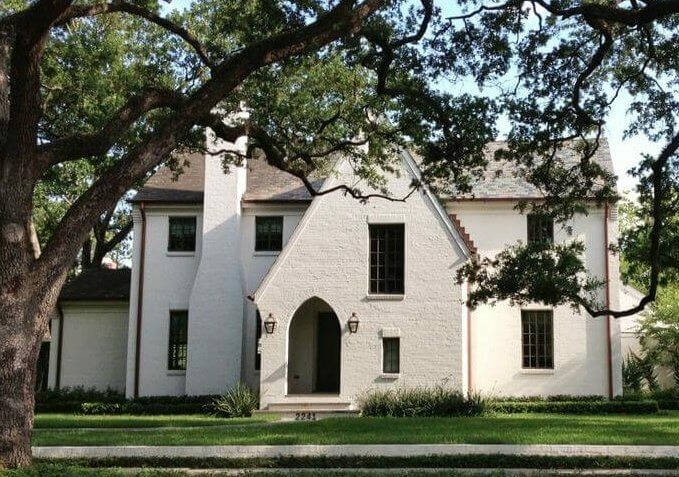 This is an excellent way to achieve the stucco look without the maintenance and cost of traditional stucco. Each of these mortar wash looks have become increasingly desirable in recent years as a way of giving the home a rustic but modern look. What Decorative Wash is Right for You? You may be wondering which decorative wash would best suite you. However, before you dive into choosing what look you like, we recommend a few preliminary steps. 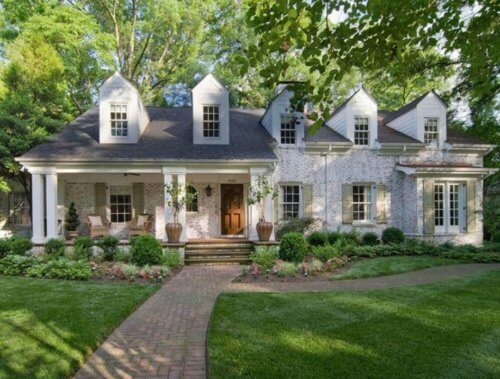 The first step is to find out if your HOA will allow your home to be altered with this type of style. Many HOAs have strict restrictions on what type of alterations can be done to your property. So before spending the time and energy in researching, have a talk with your HOA to see if it's allowed. If you are adding a wash to the interior of the home then you don't have to worry about this step. Second, you will want to consider what type of surface you are wanting the wash applied to. The masonry surface, whether it be brick, stone or stucco, needs to be structurally sound and free of any cracks or deterioration. Luckily, any masonry company that would apply the wash should also be able to repair the structure and get it ready for application. Lastly, but most importantly, you want to consider your own taste and style. Decorative washes are permanent and are difficult to remove once applied. Make sure you find the style you'll be happy with for years to come! We recommend looking at a couple of different sites for inspiration. Houzz is a great resource for searching different home improvement projects. Pinterest has a huge database of photos. Just search the different types of washes and save your favorites. Google images is also helpful and can lead you to some helpful pages or articles. Here's a great blog post that talks about each decorative washes and has descriptive pictures to help you decide. Our decorative wash crew only does decorative wash, and they do it best. We know what works and how to achieve the look you want. Choose from almost any color and we can deliver. A: Our price for applying a decorative wash on the exterior of a home typically ranges from $12,000 to $25,000. This depends greatly on the size of the home and the amount of brick to cover. For a one-story, 1,800sq ft home with brick on all 4 sides, our roundabout cost would be approximately $12,500. Q: What are the different types of wash? Whitewash: A thin haze like coating over the entire brick veneer. German Smear: A thicker coating applied in patches that creates a rustic, antiqued look. Slurry: A thick application covering the entire brick veneer to create an almost a stucco-like finish. Due to the labor-intensive nature of this work, and the skills, tools, and materials required, we have found this is a job best left to the professionals. That being said, there are plenty of DIY methods and tutorials available online. If you do decide to do this yourself, do a test sample first and make sure to buy all your material at once to avoid slight color variations that can occur in the mortar mixes. Q: What does the work entail? Preparing the home - covering windows and doors, removing exterior features (ex. shutters, light fixtures, etc.) as necessary and possible. Preparing the brick veneer surface with power washing and crack repair as needed. Application of custom decorative wash to brick veneer. Application of industrial strength water repellent to seal custom wash.
A: Our mix is a specially created formula made to achieve the best look and lasting results. Typically, a German smear or slurry is made with a mix of Portland cement, lime, sand, and water. Q: What type of material can you do a wash on? A: All three of our decorative wash applications can be done on brick and stone. In many occasions, a wash can be applied to painted brick also. Q: Can I get a decorative wash done on my fireplace/kitchen/interior brick wall/outdoor kitchen? A: Absolutely! Washes are a great way to change the look of your home without having to do major redesign or remodeling. A: For a one-story, 1,800 Sq Ft home, the entire process takes about 7-10 days. A: Our decorative washes are permanent. Natural weathering will occur over the decades as it does with any material. Q: How do I choose my style? A: With the growing trend, there is an abundance of photos online. We recommend browsing Houzz, Pinterest, and Google for the different types and choosing a few examples of ones that you like before meeting with a contractor. Q: Can I see a sample first? A: Once you approve your proposal, our first step is to go out and do a small 3x3 foot sample on your home according to the look you want. Once you sign off on this sample then we will continue with the rest of the process. A: All of our decorative washes are a permanent application. This product has a strong adhesion and is not meant to come off once it cures. We recommend that you be sure of your decision and of the look you want before proceeding. Q: How do I maintain it? A: Little maintenance is required for washes. Because washes are typically white or light in color, the exterior may become dirty over time. Light pressure washing or scrubbing should resolve the problem. We strongly recommend sealing the wash with a water repellant sealer after the application. We'll help you determine the look and color you are looking to achieve, and then tell you how we are going to accomplish your goal. One of our specialized technicians will meet with you for a tour of the property and what is to be stained. Upon approval of the estimate, we'll arrange the scheduling and let you know exactly when the work will begin.